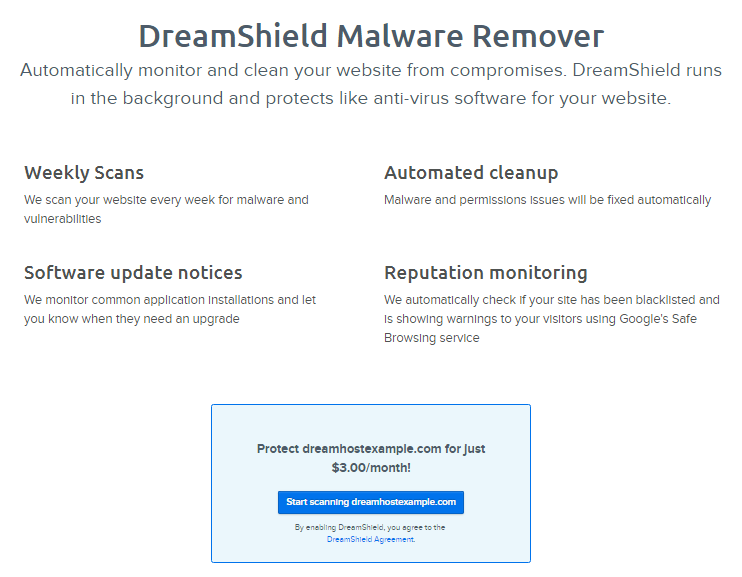 DreamShield (formerly called Malware Remover service) is an add-on that you can use on any domain (or subdomain) you like to ensure it is free of malicious code that could potentially compromise sensitive information. When you add DreamShield, it immediately runs a scan on your site, and will automatically scan it on a weekly basis after that. You are notified via email if DreamShield finds any issues. Your panel also displays this information. If the site is clean, your panel shows this information. An email is also sent that lets you know your site is clean. The following describes how to add (or remove) DreamShield to a domain using your DreamHost panel. Please take a moment to review the terms and service of DreamShield. You can only install DreamShield on a single domain or single subdomain. If you wish to install it on both 'example.com' and 'blog.example.com', you must add a separate DreamShield service to each domain. Open the Manage Domains page. Scroll down and then click the 'Add DreamShield' link under a domain. Click the blue Start scanning button to confirm and begin a scan on your domain. Return to the Manage Domains page. Click the 'Site Clean' (or 'Issues found') link to view recent results or adjust DreamShield settings. Click the 'Site Clean' (or 'Issues found') link under your domain. You may see 'Outdated Software' instead of the 'Site Clean' link. If so, click to reveal what software is outdated. It's highly recommended to always run the most up to date software to ensure your site is safe and secure. Once you update your site's software, the 'Site Clean' link will appear again. Click the blue Edit DreamShield settings link. Click the red Disable DreamShield button for your domain to deactivate the service. What do I do if DreamShield finds any issues with my website? When DreamShield completes a scan of your website, an email is sent to you with the results, and includes any issues that are found. The email also provides appropriate next steps to take (including links) in order to correct any intrusions or other threats. After you've cleaned your site of any compromised code you may want to confirm it's now secure. DreamShield runs once per week, so it will automatically inform you of any issues next time it runs. However, if you'd like an immediate scan, please submit a support ticket with the topic set to 'Abuse/Security,' who will then scan it for you. Article last updated April 09, 2019 20:49 PST.